The brutal killing of Shahzahan Bachchu, 60, on June 11, 2018 in his home village is yet another reminder of the dangers of writing in Bangladesh, the ability of words to be threatening, and the importance of freedom of expression. Shahzahan was the owner of Bishaka Prokashoni, a publishing house that specialized primarily in poetry. How could a poet be threatening? Why is the printed word dangerous enough to be killed for? In order to understand the threats posed by bloggers, poets, writers, and publishers in Bangladesh, I want to go back further – before the Bengali language movement that is so important to understanding debates about religion, secularism, and free speech in contemporary Bangladesh. Although one point is that words have power, the more important point for this article is that in the Bengali speaking region, poetic words have an illustrious history and have often been political. The Bengal region of Bangladesh and the state of West Bengal (India) has been the birthplace of numerous writers stretching back long before the British colonial period. Compositions of poetry, songs, and prose describe the beauties of nature, love for the divine, romantic love, and observations of everyday rural life. As Jasimuddin describes about the beauty of East Pakistan (today’s Bangladesh), “So many poets are there, so many makers of tunes, under the shade of the trees, under the roofs of the farmers’ broken-down cottages, in the depth of the forest, in the shadowy corners of the jute fields, in a thousand moods and a thousand postures they paint the hopes and aspirations, the sorrows and the happiness of the land. There is not a single village where there is not a poet, not a single community without its singer, and their songs our forth incessantly as the bird-music echoes in the breeze” (1951: 43). The beauty of these compositions seems to belie the edginess of a large corpus of literature in Bengali, writings which have been used to critique the establishment, motivate opposition, and transform society. But literature isn’t only political when it directly critiques.The writer’s choice of topics, language, attention to details and form are political choices. So too are collections of “Bengali” literature or culture. While there are many important literary contributions prior to British rule of India, I limit my discussion to the period of colonial rule (starting c.1600s but officially under British crown rule from 1857-1947) and up to the Independence of Bangladesh (1971). Part of the reason for this is the limited scope of this current essay, and also the easily availability of texts from this period of time. The other reason has to do with the move from oral to written forms of literature, the complicated relationship between Bengali writers and English language and ideals, and the use of literature among educated elite to create alternative visions for India. Taking as a starting point the question about “how a poet could be threatening,” I focus largely on writers who are also regarded as poets. The consequences of British rule are many and varied. Indigo, cotton, and tea became important industries for the East India Company, fueling British-Indian economic dependency and inequality. Persian was replaced by English in the courts. There emerged a new middle class – the bhadralok– of English-educated, urban, and mostly Hindu elite. Because this new middle class grew alongside British involvement in the region, they depended on the British administrators for jobs, education, and status. British census led to a more rigid caste system and official categorization of people into religious identities that suppressed a fluidity of religious and cultural practices. Further, British and European Orientalist attention to religion in India led to a revival of religion among the educated elite. We see this with reformists, such as Rammohan Roy and Swami Vivekananda, who sought to purge problematic aspects of Hinduism while embracing practices and beliefs they believed were more aligned with progressive views of society. A troubling result of this revivalism was what Abdur Razzaq, according to Moyukh Mahtab, has described as “the normalization in thinking of the society in terms of religion” (Mahtab 2017). As Mahtab explains concerning Razzaq’s influential views (Razzaq published very little himself, although he is widely regarded as having influenced scores of important intellectuals): “The philosophy, outlook on life and the literature of the two communities were either hostile, or in less extreme cases, ignorant of and detached from the lives of the other…[Reformist movements] failed to dissociate themselves from the basic assumptions of thinking along religious lines” (Mahtab 2017). Many scholars have argued that British policy of divide-and-conquer contributed to animosity between Hindus and Muslims. It did not help that British favored Hindus by providing pathways to education and administrative positions. Bengali Muslims, marginalized by British rule in India, were not as willing to accommodate English and Western educational systems. Instead, they worked to promote independence by mobilizing rural people, who suffered the most during colonial rule, by organizing peasant revolts against corrupt and often brutal zamindars (landowners, some of whom were absentee). Except for those Bengali Muslims who were part of the intelligentsia, the literature of most Bengali Muslims took a different path, some of which followed religious traditions and themes. An important intellectual movement during this period involved the Muslim rational humanists in Dhaka who were part of the buddhir mukti andolan (Freedom of Intellect Movement). These deserve attention in a different article. For now, the point is that most literary writings from this period are by intelligentsia, most from Hindu backgrounds, who integrated into British systems. While Muslim Bengalis were disenfranchised during British colonial rule, they were not silent or passive. Although communalism played a role in Bengal, so did class, educational status, and the rural/urban divide. In other words, religion was not the primary or only defining factor in identity formation, despite what Partition (Independence of India and Pakistan in 1947), which was based on religious difference, implied. It is also worth noting that some of the most famous writers hailed from what is today Bangladesh or spent considerable time there. Before Partition, geographic boundaries had very little impact on the exchange of people and ideas. In addition to new forms of governance, medicine, technology, and transportation, the British brought to India a system of education that was readily adopted by many high caste urban Hindus. English language, with its promise of social mobility, became valued, and writers of literature turned westward for inspiration, many of them reading works of Byron, Shakespeare, and Tennyson instead of drawing on indigenous sources. Some sought to imitate Western styles. As Buddhadev points out, Bengali elite found inspiration in these new forms, creating the first free verse (Madhusudan Datta) and breaking away from traditional standards of poetry. To a certain degree, modern Bengali literature grew alongside the spread of English language in the region. But while some writers were inspired by Western writers, that connection also served an impetus for self-conscious reflection and a serious examination of colonial rule and its effects on national identity and independence. This is some background into the role of the British, religion, and education in the Bengals. Know that there were many other movements going on during this historical period. For this article, I turn to the Bengali intelligentsia to see how they used their poetic words to address societal challenges. Without a doubt, the intelligentsia had much to gain personally from British governance. However, as it became clear that rural communities were suffering under colonial rule, many turned their eyes and pens to rural life. One of the first major Bengalis to raise urban elite’s awareness to rural poverty and suffering was Kangal Harinath Majumdar (1833-1896). Born in an under-privileged family in Kumarkhali, in Kushtia/Padma (in current Bangladesh), he empathized with the rural poor and sought to improve their situation. He started schools, including one for women, in his home village. In addition to being a poet, he was also a journalist and the editor of Grambarta Prokashika from 1863-1884, a journal devoted to the condition of villages and rural people. Unlike other publications that also raised concerns about injustice of tenant-landowner systems and the indigo plantations that were an important revenue source for the British, Harinath had direct experience with rural life and wrote from his village and nearby regions. This direct “news from indigo growing districts made it impossible for the literati and the administration to remain indifferent. When peasants revolted, Harinath strived to give wide coverage to their struggle and arranged financial and legal help for them” (2013: 339). Harinath’s depictions of zamindars’ exploitation of tenants meant that he was soon criticized by those landowners. But he demonstrated that the exploiters were also the police, court officials, and moneylenders (2013:341). As critical as he was about the tenant-landowner system and other regional corrupt practices, he was convinced that the government had little knowledge about the exploitation, and that they would act to improve conditions if only they knew about it. In this way, Harinath was part of a generation of Bengali intelligentsia who did not condemn British colonial rulers but saw them as benignly aiding India in intellectual and economic development. Others of that generation included Rammohan Roy, who also brought attention to the plight of rural people, Vidyasagar, and Debendranath Tagore. They were part of a generation of social reformers who sought to bring Hindu practices into line with the values of rationalism and humanism by, for instance, abolishing practices like sati, the prohibition against widow remarriage, and by critiquing Hindu practices of worshiping images of deities. Although Harinath shared a willingness to work with colonial administration to help solve local problems, he differed from most others of that generation of intelligentsia because of his intimate relationship with and commitment to rural communities. He did not have, nor did he seek, a position of power or wealth. Instead, he identified with Bengali peasantry and sought to alleviate grievances through established political structures. The last 10 years of his life, Harinath spent his time writing poetry and songs, influenced by the Lalan tradition. He retreated from actively promoting the cause of rural communities. Internationally the most famous Bengali writer was Rabindranath Tagore (1861-1941). He was a poet, story writer, composer of songs, playwright, and a painter. For his collection of poems in Gitanjali, he received the 1913 Nobel Prize for Literature and was the first non-European to receive this distinction. Tagore was born into a family of wealth and prestige, already well-positioned within the British Raj. In 1891, he went to Shilaidah and Shazadpur (currently in Bangladesh), where he lived for 10 years to manage the family estates. Developing a close attachment to rural life, his poetry and songs became animated by the rhythms of villages and nature. Although these were aspects of his poetry that were praised and likely contributed to his quick rise to international fame, they were considered more romantic than political. They have also caused people to brush off his influence because of his sentimentalities and attachment to a rural world untouched by time, modernity, and outside influences. The assessment that Tagore’s poetry is not political, however, is incorrect. In romanticizing rural life, in evoking the beauties of wandering rivers, dark forests, foaming sea, and the shadows of moonlight, Tagore turned eyes to the richness of Bengal. He found, in his searching, village philosophers who matched the wisdom of the Upanishads. He found inspiring insights into the unity of all beings. These ideas and observations not only inspired new verses; they also fueled a pride in India that rejected British claims that India was backwards and stagnant and needed external Western rule in order to progress into modernity. He was definitely not the only one to find emblems of pride within the soil of India, but he contributed a large body of poetic imagery that continues to mesmerize through songs and verse. 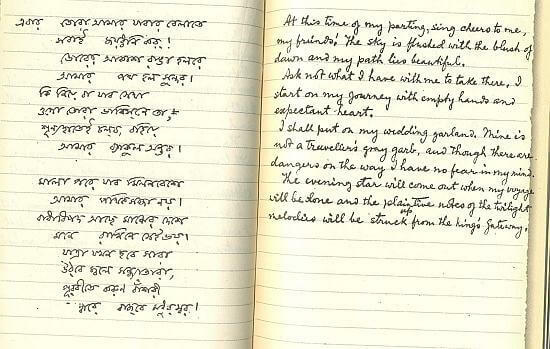 A song composed by Tagore in 1905 called Amar sonar Bangla (“My Golden Bengal”), was his response to a divided Bengal. When Bangladesh gained independence from Pakistan in 1971, they adopted “My Golden Bengal” as their national anthem. Celebrating a cherished homeland with its natural beauty is a political act with tangible ramifications on the world. While Tagore rejected British imperialism, he was also critical of Indian nationalism, especially as sectarianism increased. His role in the independence movement is complex (he and Mahatma Gandhi argued about many points), but he bolstered pride in Indian traditions, and this became inspiration for other Indians fighting for independence. Writing in English brought Tagore international recognition, but his use of Bengali affirmed the status of local language in reaching people. As Bengali readers know, their language is especially rich with metaphors, symbolism, and creative possibilities in word interpretation, and Tagore’s writing exemplifies this. With poetry and prose, Tagore promoted the use of colloquial Bengali language, thereby contributing to a larger movement that turned to local languages rather than Sanskrit, which was inaccessible to all but the high caste Hindus. He also promoted education, bringing students close to nature and to rural realities and needs (he founded Visva Bharati University in Santiniketan), unity among humans, and critical thinking. According to Amartya Sen, a Nobel Laureate as well as a graduate of Visva Bharati, what was particularly important in Tagore was “the organizing principles that moved him. The poet who was famous in the West only as a romantic and a spiritualist was in fact persistently guided in his writings by the necessity of critical reasoning and the importance of human freedom. Also, those were the philosophical priorities that influenced Tagore’s ideas on education, including his insistence that education is the most important element in the development of a country” (Sen 2011). “In his distinctive view of education, Tagore particularly emphasized the need for gathering knowledge from everywhere in the world, and assessing it only by reasoned scrutiny” (Sen 2011). This turning to Bengali soil for sources of pride in India is evident in several writers from that generation. It is also clearly evident in the work of Dinesh Chandra Sen (1866-1939), who devoted his career to publishing books about Bengali literature. Sen was born in Dhaka and graduated with a degree in English literature from the University of Calcutta. Dipesh Chakrabarty argues that Sen’s selections of manuscripts were political and represented the romantic nationalism that was part of the anticolonial period in Bengal (1890-1910) when Bengalis sought sources in the soil of Bengal about which to be proud. The collection of literature – especially “pristine” literature of rural regions, presumably untouched by foreign influences – was thus seen as a political act of resistance against colonial rule. It also sought to depict a spiritual unity among Bengalis, regardless of caste, religion, or literacy. We see this also in Tagore’s emphasis on the unity of all human beings. Chakrabarty writes, “If literature was indeed so inherently political, one can then look on [Dinesh Chandra] Sen’s passionate wanderings in the Bengal countryside around Chittagong and Tripura in his twenties—looking for old manuscripts – as a variety of romantic-political activism” (2004: 662). Ironically, in their search for indigenous sources for pride, they were well-lettered in English literature. Additionally, in seeking old Bengali manuscripts in regions of East Bengal, his collection amounted to Hindu examples. One of the researchers working with Dinesh Chandra Sen was Jasimuddin (1903-1976), a poet and litterateur, born in Faridpur (in what is now Bangladesh). Unlike Sen, he had access to and actively sought Bengali representations of literature written by Muslims. Focusing on the songs he cherished since childhood, he collected over 10,000 tunes. He argued that the lack of representation of Muslim literature in collections was due largely to the marginalization of Bengali Muslims after a series of resistance movements against British rule. After Muslims withdrew from urban centers, “the new British mode of education…belonged to the town and it spread with the growth of the middle cultures [and]created its own culture and its own literature” (1951:41). It took much longer to reach rural Muslims, many of them having good reason to be suspicious. Jasimuddin’s collection was a corrective to a predominantly Hindu narrative about literary sources in Bengal. Like Tagore, he also wrote poetry inspired by rural imagery. Called ‘Palli Kavi’ (folk poet), Jasimuddin grew up in a village of cultivators, though he was educated and belonged to the middle class. He is considered a poet of rural Bengal because of his depictions of the natural beauty of the rural regions and his connection with village people. His poetic rhythms are drawn from folk poetry, and his poems reveal experiences of rural people. If you want to see Asmani [landless people; means “sky”] Go to Rahimuddin’s small house in Rasulpur. The slightest rain pours water inside. Under its roof Asmanis’ live all year long. The ribs in her cage are witness to her starving days. wiped out by cruel poverty. Making a mockery of her golden skin. Only tears pour down in deluge. She never had a chance to sing to tune of music. Where tadpoles and moss cover the water. In its water the Asmanis carry on cooking and drinking. They have no money to call for a doctor. Tell me my jadu [“magic,” affectionate term] who will you accept with greater love. By Jasimuddin,”Asmani” from Ek Poiser Bashi (Flute for a paisa). translated by Hasna Jasimuddin Moudud. Jasimuddin was active in the non-communal cultural movement and a passionate supporter of Bengali nationalism. In the 1950s when the government of Pakistan attempted to stop broadcasting Tagore songs, on the grounds that Tagore was a Hindu, he protested boldly. As already mentioned, when Bangladesh achieved independence from Pakistan, they selected a song by Tagore as their national anthem. That is both a testament of the power of poetry to create a vision for the future and the inherent problems of inscribing religion, which essentially marginalizes segments of society, into that vision of a nation. Jasimuddin was concerned about the increasing sectarianism in his country and emphasizes the shared cultural history of Bengalis. In his autobiography, he wrote, “[T]he knowledge I obtained when a boy, of the Hindu gods and goddesses, of the method of accomplishing tasks that at first seem impossible, has helped me immensely in my creative work. The literature of this land (Bengal) is not merely Hindu literature, nor can it be said to be Moslem literature. Since both Hindus and Moslems have written in one language (Bengali), the literature of this land is both Hindu and Moslem” (Anwar 2008). Arguing that the government of Bangladesh should do more to recognize the important contributions of poets, Jamal Anwar, the son of Jasminuddin, explains that “Jasim Uddin was the champion for the Bangladesh freedom movement, taking the risk of publishing and distributing the poems on the War of Independence — about 17 poems all over the world — which created sympathy for liberation” (Anwar 2008). Awaits with its cruel claws day and night long. To sell our country’s glory to falsehood. in the joy of recreating it. will no longer rattle in battlefields. The message is not subtle in this poem; it is strident and a fierce call to action. A year later, after publishing another politically charged poem, Nazrul Islam was arrested for sedition by the British police. It would not be the first time. Whereas Kazi Nazrul was strident in his poetic critique, Jibanananda Das’s (1899–1954) approach reflected different impulses and different sensibilities. Jibananada was born the same year as Kazi Nazrul Islam. He hailed from the rural town of Barisal (Bangladesh) and was educated at the University of Calcutta. He spent most of his life in these two cities, until Partition prompted him and his family to settle as refugees of sorts in Kolkata. Come back to paths through fallow fields. Of tram tracks stretched out beneath my feet like a pair of primordial serpent sisters. A soft rain is falling, the wind slightly chilling. Of what far land of green grass, rivers, fireflies am I thinking? Have those stars been lost? As Clinton Seely, a scholar who not only translated some of Jibanananda Das’s poetry, but also gave a sensitive contextualization of his life and work within the literary movements at that time, explains that Jibanananda’s later poetry revealed that the world during the 1940s and 50s [made]“little or no sense” to him. 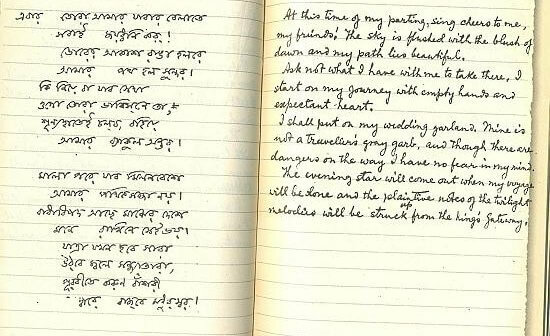 “[W]ith a world war, and the partition of South Asia, and his own abandoning of the ancestral home in Barisal to come to Kolkata permanently… the incomprehensibility within his poetry mirrors the fact that the real world has become, for him, unintelligible” (Seely 2011-15). If the world had become incomprehensible by the time of his early death in 1950s, what would he think during the war of independence for Bangladesh and the decades since then? One thing we know is that his poems in Bengal the Beautiful were inspiration for those fighting for Bangladesh’s independence from Pakistan in 1971. They evoked pride in Bengali language, literary heritage, and potential. Reposing on this bank in blue Bengal, what shall I think, all alone? Thick rhythms of the kirtan, bhasan gan, rup-katha, pancali, and yatra. The poets in this article exhibit pride in Bengal’s sources of creativity and beauty, a willingness to defend rural life and people, and an increasingly open critique of British rule. Jibanananda Das carries forward many of these ideas, but his honest depictions of a world gone wrong reveal the bewilderment we should all acknowledge when bearing witness to violence and destruction. As any historian, social scientist, or observer of world dynamics will say, society is never fixed but is constantly changing. This means that nations may give the appearance of being immovable fixtures, but in fact they are far from stable. The dramatic social, cultural, and political changes in South Asia within the past 100 years make this very obvious. A snapshot of Bangladesh over the past 50 years also confirms how quickly significant changes can occur – and how important each player is. Similarly, there has never been a fixed Bengali identity. What it means to be Bengali, or Bangladeshi, or Muslim in Bangladesh has been variously interpreted and contested, sometimes bloodily. Sherry Ortner uses the term “serious games” to refer to society-changing projects that involve the intense effort, or “intense play,” of people “pursuing cultural goals within a matrix of local inequalities and power differentials” (2006:144). Players in serious games work to create the society they dream possible or at least believe to be right. And while those in positions of power (e.g. the government or wealthy landowners) are likely to resist changes that do not benefit themselves, “the dominated too always have certain capacities, and sometimes very significant capacities, to exercise some sort of influence over the ways in which events unfold” (Ortner 2006:144). Contemporary Bangladeshi poets, bloggers, publishers, and writers participate in the “serious game” about the roles of religion, women’s rights, LGBTQI rights, and freedom of expression within Bangladesh. That other people have resorted to machetes and firearms shows how powerful and threatening the pen (or keyboard) is. We often turn to poets to help us make sense of the world. In Jibanananda view, “Poetry and life are two different outpouring of the same thing; life as we usually conceive it contains what we normally accept as reality, but the spectacle of this incoherent and disorderly life can satisfy neither the poet’s talent nor the reader’s imagination … poetry does not contain a complete reconstruction of what we call reality; we have entered a new world” (in Seely 1990:111). But beyond making sense of the world, poets – and other writers and creative artists – help to create that world. (See also Roger Sneed’s article in this issue, in which he shows how science fiction creates visions of society free from harmful systems of inequality like racism.) I do not mean that they recreate the world by reminiscing about a previous golden age or by creating an unrealistic romantic nationalism, although poets have done that too. Rather, I want to emphasize the productive power of words and creativity. In his essay about Bangladeshi intellectual creativity, Anisuzzaman states that “creativity may be defined as the capability to cope with the changing or unforeseen situations, resulting in ‘products’ which are ‘new’ and ‘original” (1993:11). In his autobiography, Jasimuddin says something similar. He begins by praising his mother’s creativity: “Receiving the magic touch of my mother’s hand, the bits of rice and treacle would become such delicious rice cakes and be transformed into something new. This is the task of every artist. He takes what he has to work with and, manipulating it according to his liking, gives it new life” (Anwar 2008). In “serious games,” creativity is not entertainment or simple pleasure, even though a poem, song, or work of art may also give enjoyment or emotional release. Instead, creativity is integral to envisioning possibilities and recreating the world. Again citing Anisuzzaman, intellectual creativity “provides the source of values, beliefs, and world-views which constitute the bed-rock of any culture”…and serve “as a mechanism for either legitimizing or repudiating any given socio-economic system (1993:12). In the examples of Bengali poets, we see creative responses – sometimes fiery, other times alluring, and always Bengali – to a world not entirely of their making. In responding to outside forces – within the time-frame of this essay, mostly British colonial forces – these poets selectively assimilate and recreate new forms of writing, new values, and new ways of living in the world. The ability of words to transform cannot be taken for granted, however. Recalling that serious games involve both power and resistance, it is worth noting that Kazi Nazrul Islam, the Rebel Poet of Bangladesh, was recently lauded by Hindutva (Hindu nationalists). Not only does this contradict Kazi Nazrul’s life and work, it also contributes to the erasure of the religious and cultural diversity within the subcontinent. In a recent article, Ankan Kazi, a Jawaharlal Nehru University research scholar and great-grandson of Kazi Nazrul, warns people about cultural appropriation, such as the religious right appropriating the symbol but not the message of Kazi Nazrul. Furthermore, he adds, “It should hardly come as a surprise that the most radical instinct in his [Kazi Nazrul’s] work today is not his dedicated opposition to an occupying foreign rule — it is the vision of a secular society that he embodied in his poetry, songs, prose and his own life.” It is a reminder that “serious games” require citizens to be responsible readers and critical thinkers, as well as responsible writers. And say whatever it is that you want to say. Kindle your ribcage and blaze your own way. If Anisuzzaman and our Bengali poets give evidence of the intellectual creativity within Bangladesh, Hannah Arendt’s words can serve as inspiration about the important role of creative words. A twentieth century political philosopher who wrote about the nature of freedom and democracy, especially in light of totalitarianism and violence, Arendt argues, “The smallest act in the most limited circumstances bears the seed of … boundlessness, because one deed, and sometimes one word, suffices to change every constellation” (1958, my italics). If words of poets are like seeds, then their growth can lead to a groundswell. Of course, these poets were not only poets; they did many other things too. They wrote essays, published, edited, and promoted their causes in a variety of ways. But I pause on their identity as poets, an identity so often associated with a sensitive observer of the world rather than as an active change-agent. The words of these poets continue to resonate with current Bengalis – regardless of which side of the national border. They speak a truth that simultaneously evokes romantic feelings about homeland and also universal messages about freedom from oppression and censorship, about human dignity and rights, and about being willing to struggle for those values. We are in another one of those moments – both in Bangladesh and in many parts of the globe – when core values of humanism and equality are being challenged in today’s serious game. Now, as before, we need poets to make sense of the world and show the path forward. A final point. Consider how carelessly people use words today, and how the anonymity of the Internet has allowed people to speak without much thought about the effects of their words. In this context, the poet – who deliberately examines each word, each turn of phrase, each potential meaning for expressions – engages in an activist’s pursuit for a better world. Whether the poem is about love or societal ills, the mere act of writing poetry is a rejection of contemporary sound bites and callous verbal attacks. In the face of political turmoil, violence, poverty, global inequities, and environmental disasters, a poet’s attention to verses is, in itself, a political act. Alam, Fakru, and Radha Chakravarty, eds. 2011. The Essential Tagore: Rabindranath Tagore. Cambridge, MA: The Belknap Press of Harvard University Press. Anisuzzaman. 1993. Creativity, Reality, and Identity. International Centre for Bengal Studies. Dhaka: Bangladesh. Anwar, Jamal. 2008. “On poet Jasim Uddin’s 103rd birthday.” The Daily Star, January 1. https://www.thedailystar.net/news-detail-17281. Accessed July 8, 2018. Arendt, Hannah. 1958. The Human Condition, Second Edition. Chicago: The University of Chicago Press. Bose, Buddhadeva. 1964. “Modern Bengali Literature: A Study in Indian-Western Relations.” Comparative Literature Studies1(1): 47-53. Chakrabarty, Dipesh. 2004. “Romantic Archives: Literature and the Politics of Identity in Bengal. Critical Inquiry 30(3): 654-82. Hussain, Azfar. 2017. “Kazi Nazrul Islam: More than a rebel poet.” The Dhaka Tribune.May 5. https://www.dhakatribune.com/magazine/arts-letters/2017/05/05/kazi-nazrul-islam-rebel-poet. Accessed July 25, 2018. Jasimuddin. 1951. “Folk Music of East Pakistan.” Journal of the International Folk Music Council3: 41-44. Kazi, Ankan. 2017.“Diminishing A Poet.” The Indian Express. June 14.https://indianexpress.com/article/opinion/columns/diminishing-a-poet-kazi-nazrul-islam-4702739/. Accessed July 30, 2018. Parthib, Sukanta. 2017. “The legacy of Kangal Harinath: Remembering the pioneer of investigative journalism on his 121st death anniversary.” The Daily Star. April 16. (Last modified April 18, 2017). https://www.thedailystar.net/country/the-legacy-kangal-harinath-1391845. Accessed July 16, 2018. Raha, Bipasha. 2013. “Harinath Majumdar and the Bengal Peasantry.” Indian Historical Review 40 (2): 331-353. November 26. _____. 2005-06. “Imagining the Peasant: Muslim Literature in Bengal in the 1920s.” Proceedings of the Indian History Congress 66: 640-649. Ramachandran, Smriti Kak. 2017. “RSS to eulogise Bangladesh’s national poet Kazi Nazrul Islam as ‘good Hindu.’” Hindustan Times. April 23. https://www.hindustantimes.com/india-news/rss-to-eulogise-bangladesh-s-national-poet-kazi-nazrul-islam-as-good-hindu/story-a1RgOk3YlAh5sRoPLDXVnK.html. Accessed July 30, 2018. Seely, Clinton B. 1990. A Poet Apart: A Literary Biography of the Bengali Poet Jibanananda Das (1899–1954). Newark: University of Delaware Press. Seely, Clinton B., translator. 2011-15. The Scent of Sunlight: Poems by Jibanananda Das. Parabaas. https://parabaas.com/jd/articles/seely_scent.shtml. Accessed July 8, 2018. Sen, Amartya. 2011. “Poetry and Reason: Why Rabindranath Tagore Still Matters.” The New Republic, June. https://newrepublic.com/article/89649/rabindranath-tagoreAccessed July 19, 2018. Ortner, Sherry. 2006. Anthropology and Social Theory: Culture, Power, and the Acting Subject. Durham, NC: Duke University Press Books. International Center of Nazrul. icnazrul.com. https://www.icnazrul.com/index.php/nazrul-s-work/poems/36-poetry-lyrics/49-the-rebel-bidrohi. Accessed July 20, 2018. Lisa Knight is Professor of Religion, Asian Studies, and Anthropology and Chair of the Department of Asian Studies at Furman University in South Carolina.